Chef Brett Williams’s Bolognes, at Orta in Pembroke. IN THE KITCHEN Up and coming cooks move around a lot. It’s a way of being in the restaurant world: You work in a kitchen developing skills then migrate from place to place, cooking under different chefs, as you ascend the ranks. As a high school kid, Brett Williams, the now 35-year-old chef-owner of Pembroke’s Orta Restaurant, worked a couple summers at chef Jimmy Burke’s Riva in Scituate. When college loomed, it hit him that maybe he should go to culinary school instead, so he asked for Burke’s advice. “I remember he said, “Sure, you could go to the Culinary Institute of America like I did, or you could save $60,000 and stay here and I’ll teach you everything I know,’” Williams recalled of his conversation with Burke. Williams took him up on his offer and worked at Riva for about six years, ending up as its chef. By the time he bought Orta in 2012, Williams had worked in several restaurants, including kitchens in Italy’s Tuscany and Piedmont regions where he fell in love with Italian cooking. His last job was a two-year stint as the executive chef at Boston’s Stella. Soon thereafter, Williams and his wife, Cara, started looking for a place to call their own. In a circular kind of synchronicity, it just so happened that Burke was selling the restaurant he’d opened after he’d sold Riva. Boom: It was Orta! THE LOCALE On a recent Friday, Orta was packed at 6 p.m. with a friendly, casual, solid crowd: families, couples, groups of friends. The vibe of the 125-seat restaurant is warm, with an old-world feeling in its dark woods, stone, and big open kitchen. There are alcoves for four-tops, freestanding booths, and high-tops in the big bar room out back. At the intersection of Routes 53 and 139, Orta anchors an attractive strip, recognizable by a small bell tower feature reminiscent of similar ones all over Italy. ON THE MENU The menu has three sections: appetizers, including salads; pizzas; and a dozen main courses split among pasta and meat, fish, and fowl. On one of two recent visits, we started with a cup of butternut squash soup ($7). This beautiful puree is lit with tiny slivers of crunchy fried sweet potato sticks and meaty dried cherries. Another night, the kitchen nicely fulfills a request to add romaine lettuce to the arugula salad ($9) and splits it for us — seeing we were two. Orta’s wood-fired pizza oven turns out nice pies with many alluring toppings, but I’m crazy about the red sauce on the Margherita ($15). The good honey-glazed salmon ($29) is enhanced with a terrifically flavored dollop of caper remoulade on top. The fish is served with much-appreciated large portions of two vegetables: a delicious spaghetti squash and an equally good sautéed spinach. The braised short ribs ($29) is a rich, delicious dish. A large helping of tender meat is surrounded with a rich wine sauce and gnocchi in a pecorino cream. 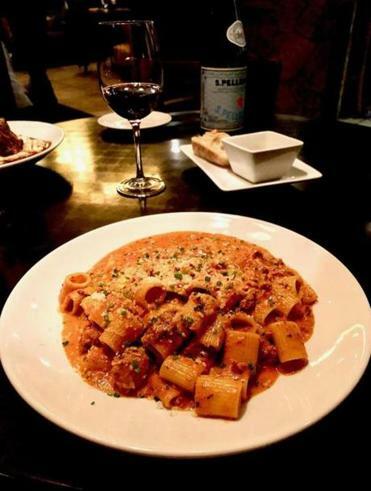 The baby rigatoni Bolognese ($22) is a large plate of pasta covered with lots of a thick, creamy, red sauce textured with beautifully seasoned bits of various herbs and meats. That classic dessert — crème brulee ($9) — comes with a vanilla gelato it doesn’t need. Why bother when the delicate flavor of this velvety custard is so heavenly? Orta Restaurant, 75 Washington St., Pembroke, 781-826-8883, www.ortarestaurant.com.